Tushee wipes are thick and perforated so do an incredible job in cleaning those difficult places down under without having to take a bath!! Can also be used to clean paws, eyes, and ears. They work incredibly well on other small animals such as Rabbits and Ferrets..completely safe and effective! 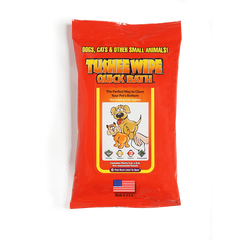 Tushee wipes are formulated with effective cleaners that remove bacteria and odors from your pets skin. Quick Bath wipes contain Vitamins A & E and Aloe Vera which promotes an overall healthy skin and coat while leaving your pet clean and shiny. 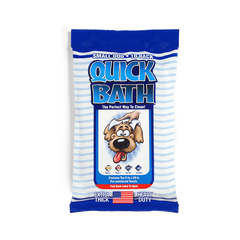 Quick Bath wipes are pH neutral and alcohol-free.